At the weekend, Jay Z reclaimed his throne as the King of Hip Hop as he took to the stage at Weston Park to perform to 85 000 fans at V Festival. Accompanying him on his minimalist set was little else but a 40-foot inflatable Jeff Koons balloon dog. This is the first time the rapper has performed tracks from his latest album release 4:44 and his first UK live performance in four years, since his Magna Carter World Tour. 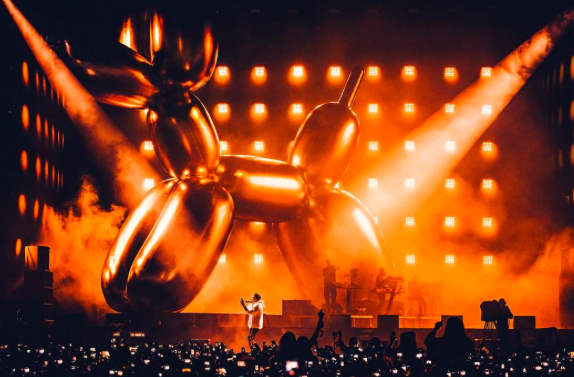 To mirror the minimalist aesthetic of the album artwork, Jay Z took to the stage with what appeared to be an orange Jeff Koons balloon dog, which at times became a shade of blue. All this only begs the questions: was the balloon dog an original Koons? And are the creative duo planning a project? If they did, it would be a lucrative one, as Jay Z's 4:44 went platinum in less than a week, whist back in 2013, Koons set a record as his Balloon Dog (Orange) sold for $58.4 million at Christie's, making it the highest price ever paid for a work by a living artist. Check out more realised prices for Jeff Koons here.